MyHeritage has added the Trove newspaper collection to their collections, and these are now available as record hints when you have a family tree at MyHeritage. Since I do have a tree at MyHeritage, I decided that it would be easier to decide which articles to use for my Trove Tuesday post if I went through the hints. I found in the hints an article about the death of John Joseph Mulder. John died in Victoria, and this article was from Queensland, so I wanted to see if there was an article in Victorian newspapers that would provide more details. The disadvantage of the MyHeritage hints is that they are completely random, which means that I would have to go through all the hints, to try and find other articles about John. I decided it would be easier to use the Trove website, to search for all the articles about “John Mulder”. There were a number of articles about his death, in various newspapers around Australia. I have decided to include the ones with the most information about John, and his death. A passenger train was moving from Boxhill Station last evening when a fireman, named John Mulder, fell through the brake gear on the line, and five carriages went over his body, which was fearfully mutilated. He died five hours afterwards. He leaves a wife and child. Deceased was lighting a lamp in front of the engine at the time of the accident. 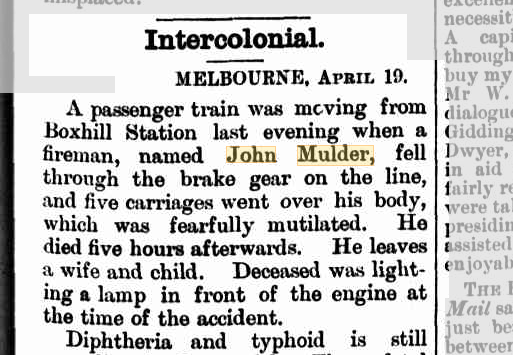 An accident of a very painful character, which had a fatal issue, occurred last Wednesday to a young married man named John Mulder, aged about 26 years, employed as fireman on the engine attached to the Box Hill train. It appears that whilst the 5.30 train was standing at the Box Hill station platform Mulder proceeded to the front of the engine for the purpose of lighting a lamp attached to the tender. Presently the starting signal was given, and driver Swift, thinking that his companion was in readiness for the journey, set the train in motion. After going about 50 yards Swift noticed that Mulder was not on the engine, and concluded that something must have happened to him. He instantly applied the brake, and on the train being brought to a standstill the unfortunate young man was found lying between the rails in a fearfully mutilated condition. The station officials carried him into the office, and Dr. Vaughan was quickly in attendance. It was found on examination that both his legs had been broken above the knees, the thigh fractured, and that one of the ankles had been badly crushed, while it was evident that he had sustained very serious injuries internally. Dr. Vaughan did everything in his power to relieve the sufferer, who was afterwards taken to Camberwell, and conveyed in charge of Porter Fuller into Melbourne by the 6 o’clock train. It is supposed that Mulder slipped off the engine when the train was started, and got jammed between the sleepers and the brake apparatus underneath the engine. Notwithstanding his fearful injuries, Mulder was still alive and conscious on his arrival at the Melbourne Hospital. His own account of the accident is that whilst reaching down to light the rail lamp he had to hold on by a portion of the lamp fittings, which gave way under his grasp, and he fell between the rails. At the institution the suffered was received by Dr. McKnight, and attended to by that officer pending the arrival of Dr. James, to whom a message was sent to take charge of the case. The unfortunate man, however, lingered only a few hours, and died at half-past 11 o’clock. The deceased resided at Edgar-street, Box Hill, where he had been stationed for the past 15 months. An inquest will be held in due course. THE FATAL RAILWAY ACCIDENT AT BOX HILL. An inquest was held yesterday at the Melbourne Hospital by the City Coroner concerning the death of John Joseph Mulder, which took place in that institution on Wednesday night last. The deceased was a fireman engaged on a passenger train on the Box Hill line, and on Wednesday evening was picked up between the rails near the Box Hill station in a dreadfully mangled condition, and conveyed to the Melbourne Hospital. Particulars of the occurrence have been published, and the evidence adduced at the inquiry was merely recapitulatory. 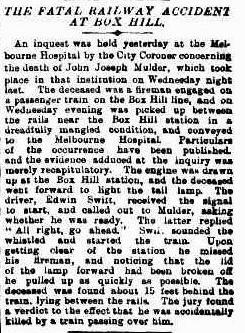 The engine was drawn up at the Box Hill station, and the deceased went forward to light the tail lamp. The driver, Edwin Swift, received the signal to start, and called out to Mulder, asking whether he was ready. The latter replied “All right, go ahead.” Swift sounded the whistled and started the train. Upon getting clear of the station he missed his fireman, and noticing that the lid of the lamp forward had been broken off he pulled up as quickly as possible. The deceased was found at 15 feet behind the train, lying between the rails. The jury found a verdict to the effects that he was accidentally killed by a train passing over him. John Joseph Mulder was born in 1861 at Ballarat West. He was the son of William Joseph Mulder and Caroline Wynn. (William was the brother of my ex-husband’s 2x great grandfather Jacob Thomas Alexander Mulder). Lily Wilhelmina Mulder, born in 1882 in Ballarat. Carol Winn Mulder, born in 1884 at Hawthorn. Carol died in 1885 at Fitzroy North. Ethel Maud Mulder, born in 1886 at Fitzroy. Ethel died in 1886 at Fitzroy South. After John’s death, his wife Mary and daughter Lily ended up moving to Western Australia. His daughter Lily married James Pascoe in 1902. Mary died in 1935, and Lily died in 1960.